I have a whole week of postings for you on all the little gifts I've made to take to Stampin' Up! 's Leadership conference in Nashville, TN. First up are the stacked little Hershey bars with decorated clothespins. OMG - You ROCK lady!! These are just adorable! I can't wait to see what else you have made for Leadership. Have a SUPER FUN time!! OMG Becky, these are so cute!! I can't wait to see what you have in store for us the rest of the week. Hope you have a great time at Leadership!! DARLING!! I've been up all night waiting for this post because I knew you timed it when you are gone. It was worth the wait!! (Just kidding on the stayed up all night part....) Thanks for another great Becky Original!! So cute! I knew I should have purchased that paper. Thank goodness it's not too late! Thanks so much for sharing your talent with us. 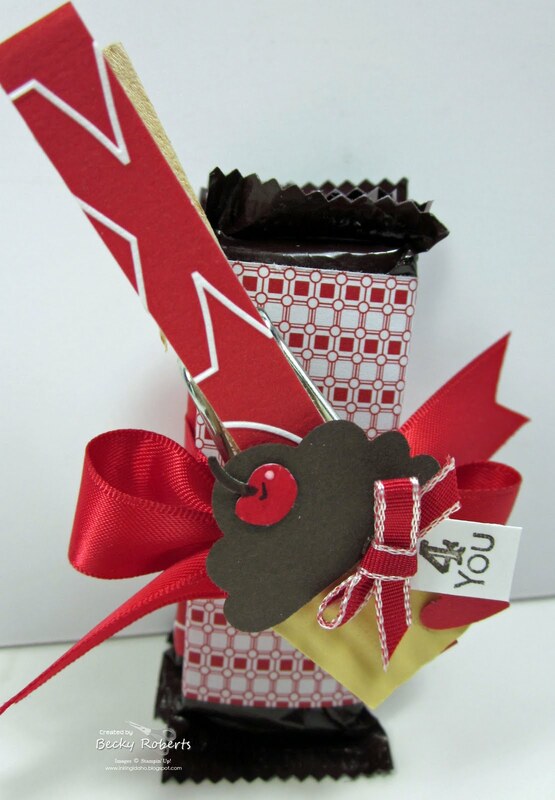 What a cute Valentine gift idea. So Super Cute!!! I love the cute clothespins. Is the cupcake glued to the clothespin? The colors just scream LOVE!!! FABULOUS, Becky. Have fun and please be sure to say "hi" to my friend Brenda Luter from St. Louis. Love your work!! Cute, Cute, Cute! I know they will be well received! Have fun and travel safely! 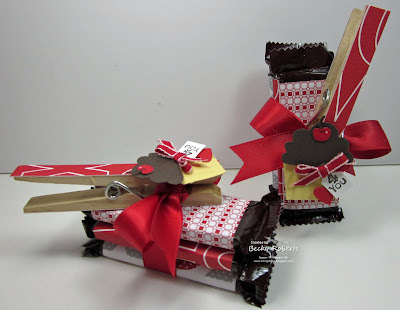 LOVE them, fantastic idea putting the clothes pin and hersheybars together, and love the designs. Becky, you have the BEST projects! I've left you a Stylish Blog award - your projects always rock my socks! The award is a mixed blessing, since you're supposed to pass it on, but whether you choose to do that or not I wanted to let you know that you inspire me! Becky these are so cute. 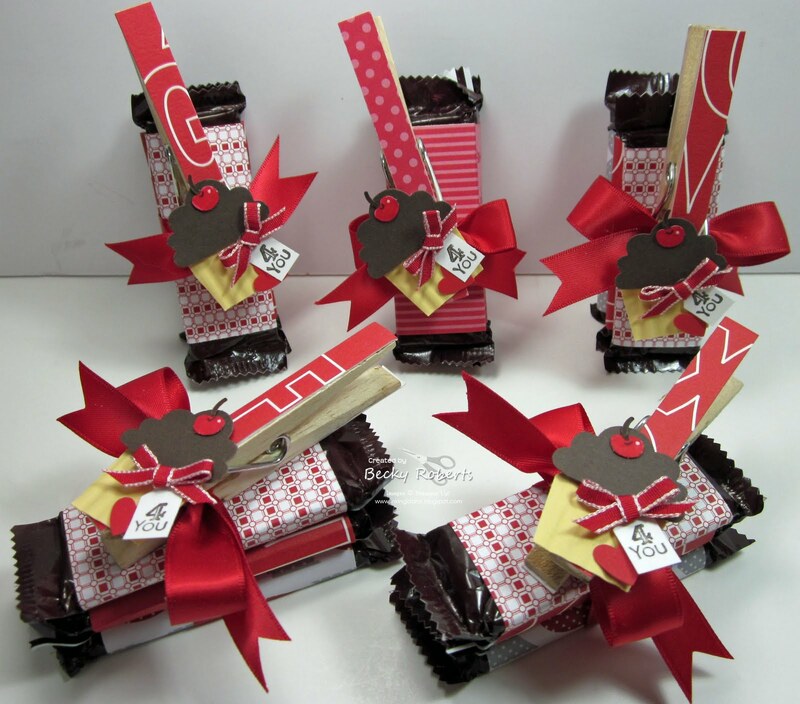 I bet you are having loads of fun making all these cute goodies. Thanks for sharing your many talents. These are just so cute and quite orginal - love that paper too! Have a great time at Leadership. Absolutely ADORABLE! Ive gotta case them! My stamp girls will love go bananas! TFS!